Why not arrange a group visit for your organisation? 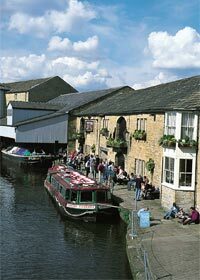 The Visitor Centre is the ideal place to find out what life was like in Victorian Burnley. We open specially outside normal hours, including evenings, for party visits. These can include a guided towpath walk through the Weavers' Triangle and a visit to Oak Mount Mill Engine House, ending up with tea and biscuits in the Victorian Parlour. The cost is just £3 a person with a minimum of £30 per party. Tea and biscuits are an additional £1 per person. If the visit includes the engine house, an extra donation of £1 per visitor for the Heritage Trust for the Northwest is requested. ...to arrange a date and time. If you want to book a group visit for a school or college, click here.